Annie was born in rural Oglethorpe County, Georgia, in 1927 and she spent all of her life nearby. One of eleven children, she grew up working on the family farm. She experienced health problems all her life and for many years she couragiously battled cancer. She was truly a fighter. She told us of being called to paint years ago in a vision. Returning home after an extended hospital stay, she weighed a mere 70 pounds at the time. 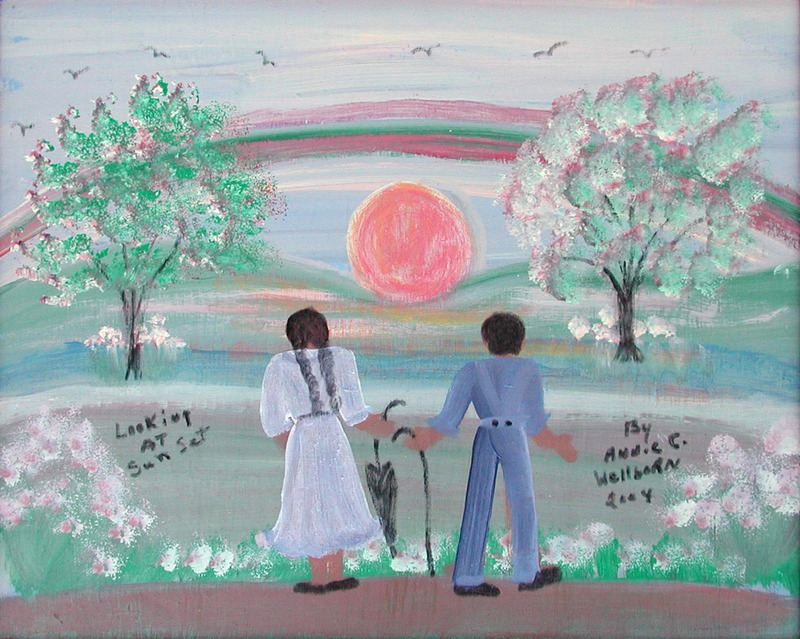 The Lord revealed to her that others would come to know Him through her painting. In her vision she told the Lord she didn't want to be well known. 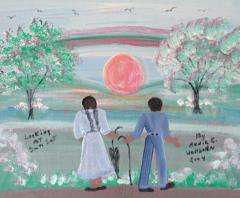 He responded, "yes, but I do," and so she began to paint. She always felt very humble that God gave her this talent. 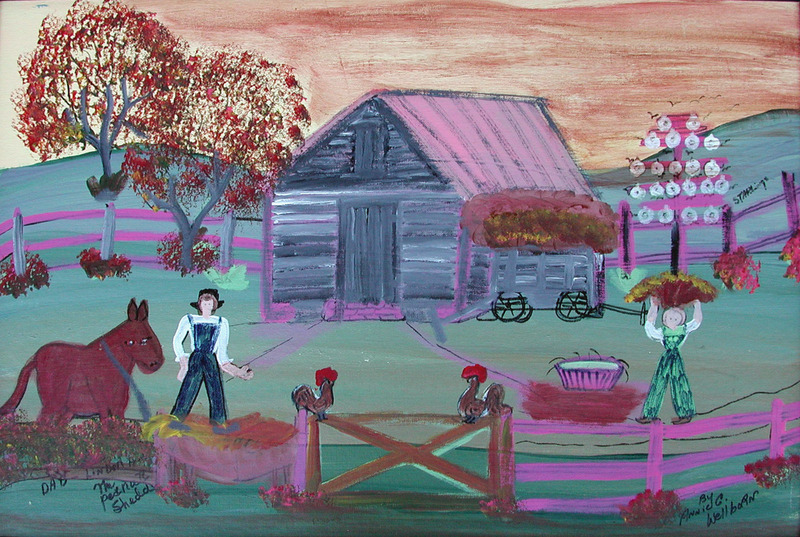 She painted her memories of rural family life, as well as the visions she had since childhood. 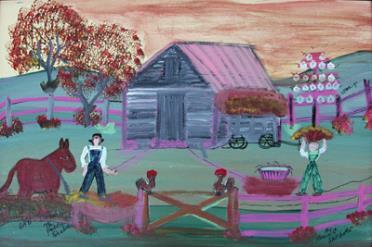 She used acrylic paint which she applied to almost any surface imaginable. 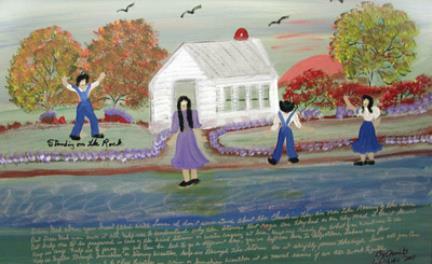 She also created handwritten and illustrated memory books, each one unique and treasured. Annie had frequent visions of angels over her bed, some of whom she recognizes as close relatives, and they were regular subjects of her work. 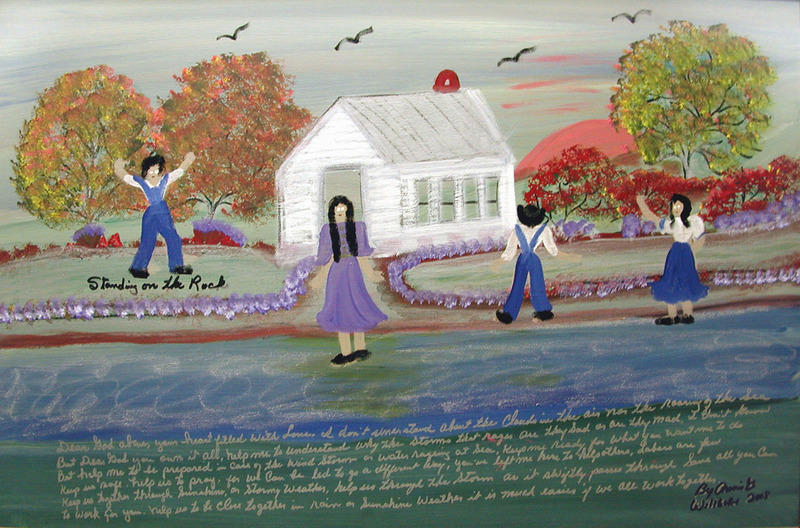 The skies of her paintings often contain a fireball, a vision that she had seen many times. She believed the ability to see them was inherited and will continue to be passed on. She said the fireballs might signal the arrival or departure of someone very close to her. "Or", she would add with a smile, "they might mean nothing at all." 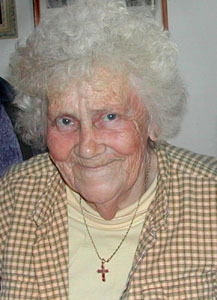 Annie passed away peacefully on April 23, 2010 at her home in Statham, GA. She was one of the sweetest people on Earth. "Dear God above, your heart filled with love, I don’t understand about the clouds in the air nor the roaring of the sea. But Dear God you own it all, help me to understand why the storms that rage are they sad or are they mad. I don’t know. But help me to be prepared in case of the wind storm or water raging at sea. Keep me ready for what you want me to do. Keep us safe, help us to pray, for we can be led to go a different way. You’ve left me here to help others. Labors are few. Keep us together through sunshine or stormy weather, help us through the storm as it swiftly passes through. Save all you can to work for you. Help us to be close together in rain or sunshine weather it is much easier if we all work together."